Lella Umedaly nee keshavjee's family travelled from India to South Africa, then to Kenya. She married Shamas Umedaly and had 5 children Nzeera, Mossadiq, Muneera, Umeeda and Hamed. She has eight grandchildren who she dedicated this book to. Today, my children and grandchildren often ask me how to cook various dishes, and they have been requesting a legacy of fast, tasty recipes that embody the meanderings of our diaspora. I have spent four years on this cookbook, working out the measurements and accurately noting the best cooking methods. It has been an enjoyable but frustrating experience because I had learned to cook by feel, smell, color, texture and the look of the dish. We used to pour the ingredients into the palms of our hands or the lid of the container, sensing the right amount while adjusting for the likes and dislikes of the guests. I must admit that the most difficult part about writing this book has been developing exact measurements. 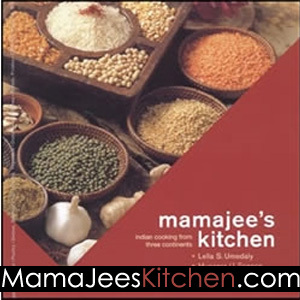 Lella Umedaly, a grandmother of 8 shares her skills in Indian cooking with her family. She tells teh story of her family andlove of food. Writing this book has been a labor of love, helping me rediscover the recipes that nourished my family. It has encouraged me to invite old memories and relish new thoughts. With each recipe I remember a person, a story and a feeling, In this book I see so many colors, smell the spices, hear the laughter, and I feel the tears and the challenges that have made me who I am today. I remember my father’s response to my request for flight lessons, when I wanted to be a pilot: “Lella, you learn how to pilot your pots and pans!” And here I am actually doing it. But most importantly I realize that the dishes form a bridge from my past to my grandchildren. Now these recipes will be a bridge to you and your families, too. I look forward to sharing these tasty, quick dishes with you. Enjoy forming your own memories over these meals.